Last night I discovered a large welt on the back of my right thigh. The swollen area was about the size of a half-dollar coin; the epicenter was a reddish grey throbbing bump. I must have been bitten by an ant or a spider. And if I get bitten, I bite back…into fresh produce that I buy at a market. 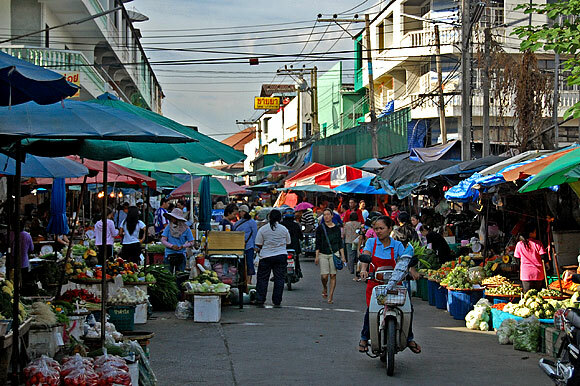 Muang Mai Market is arguably the largest fresh produce market in Thailand. That alone was reason enough to drive there today. We haven’t been cooking very much due to the abundance of cheap restaurants, laziness, and lack of kitchenware. Although last night we made a pretty good vegetable soup with pepper pork ramen. 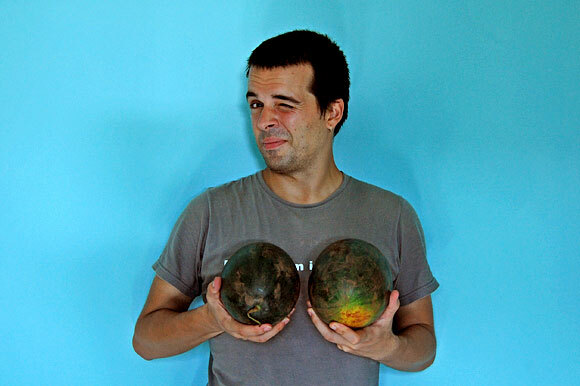 Most of our market purchases are of the fruit variety. So that’s what we went searching for. 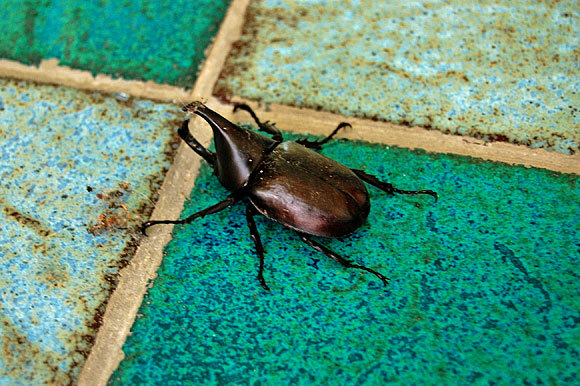 Rhinoceros beetle outside our door. But first we met E. for an organic and tasty lunch at Pun Pun. Three different kinds of ants were swarming our table: large red ants, medium black ants, and small brown ants. Once they found syrup to eat they became less chaotic. 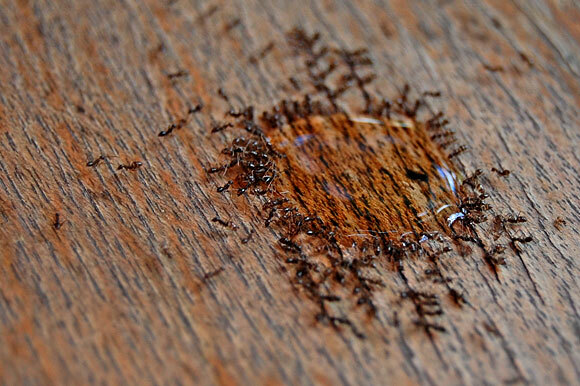 One section of the table was formally declared ant territory. We didn’t bother them, and they didn’t bother us. Afterward we had coffees at the coffee van. Sitting in the back of the van in the warm shade, we discussed the two girls that were flirting with the barista, sampled some small cookie desert, and enjoyed each other’s company. Ants eating simple syrup I poured on the restaurant table. Cue festering violin score. The market isn’t as bustling between morning and evening, so we passed some time driving along the superhighway and north along the Ping River. The neighborhood wasn’t anything special, so went south past the market. 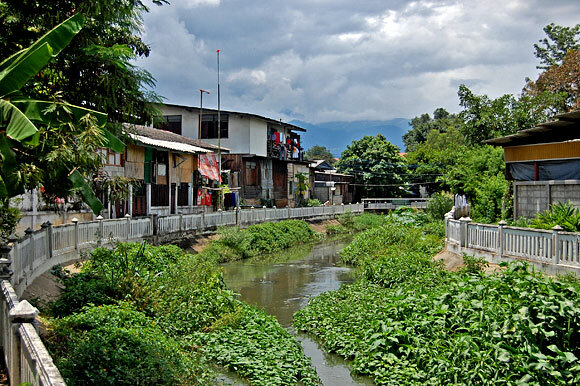 This area contained a lot of old buildings, narrow alleys, canal and river views. It was fun to explore. Around 5, we headed back to get some ‘duce. 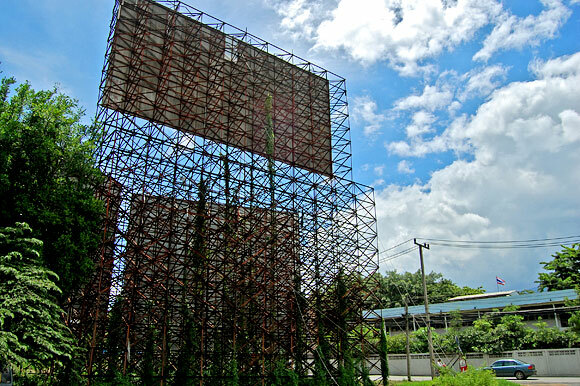 Over complicated and still rickety looking billboards. This one is at the northwest corner of the moat. Small canal and pathway on the east side of town. 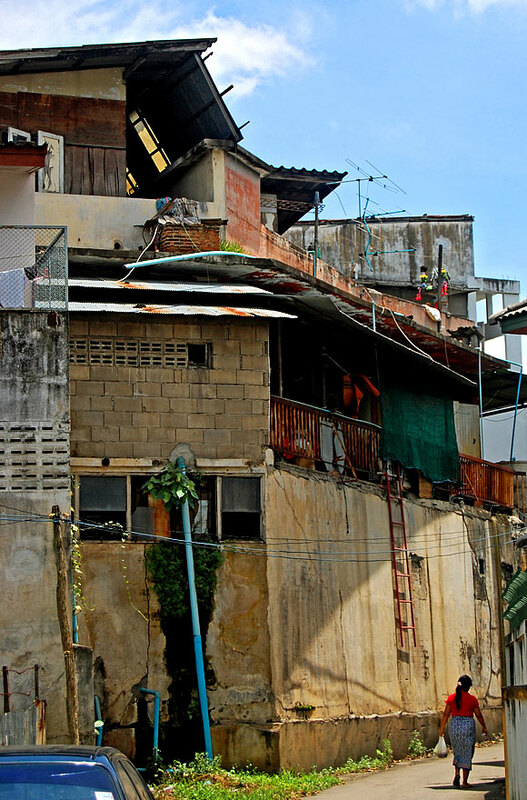 Lady walking down the alley with a crazy, cobbled together mess of a building to her left. 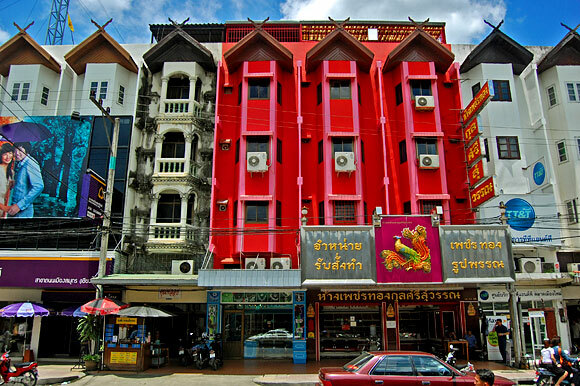 Bright red building near the market. 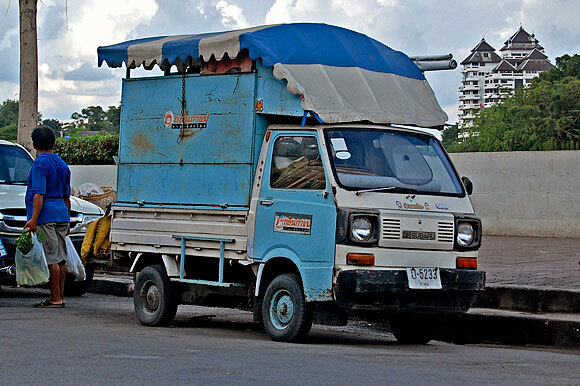 This mini delivery truck cracks me up. One of the produce streets. 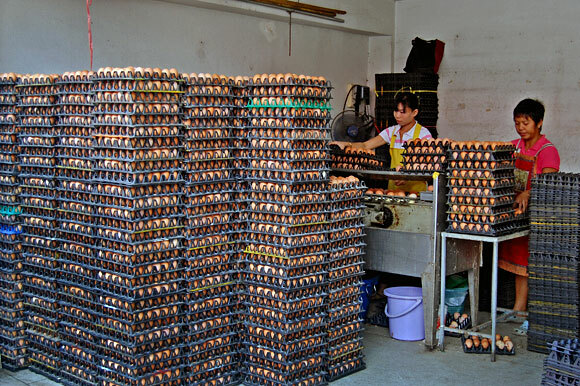 Eggs for sale. I wonder if working around so many eggs makes these fine ladies more fertile? 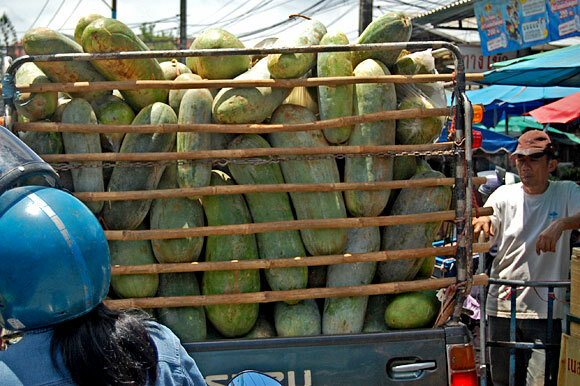 Truck full of huge squash. It was causing a traffic jam in the tight pathway between vendors. 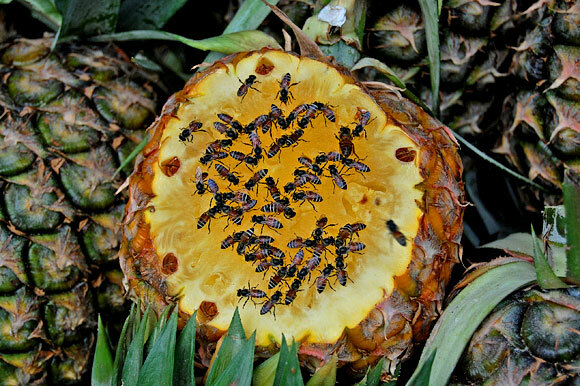 Bees really seem drawn to pineapple more than other fruits. 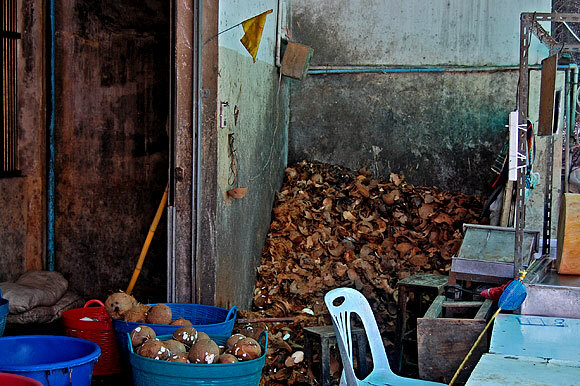 Discarded coconut shells in the corner of a coconut milk making shop. 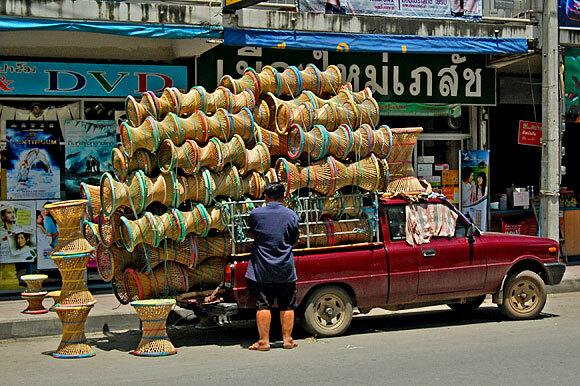 This man is figuring out how to cram four more baskets onto the truck. 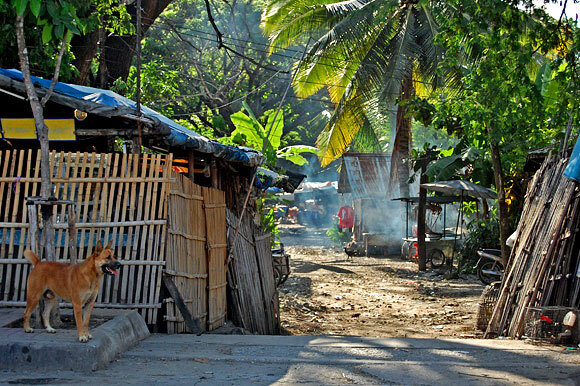 A rural village feeling oasis in the middle of town. 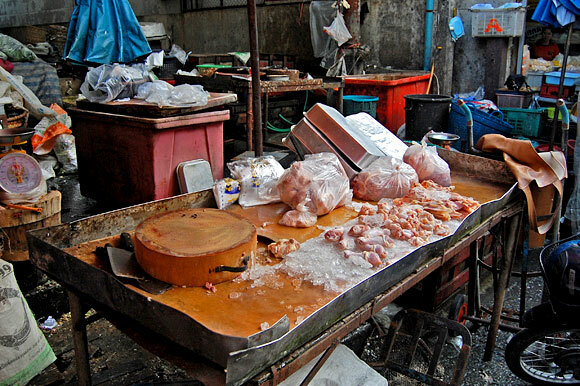 A chicken parts display of questionable sanitation. 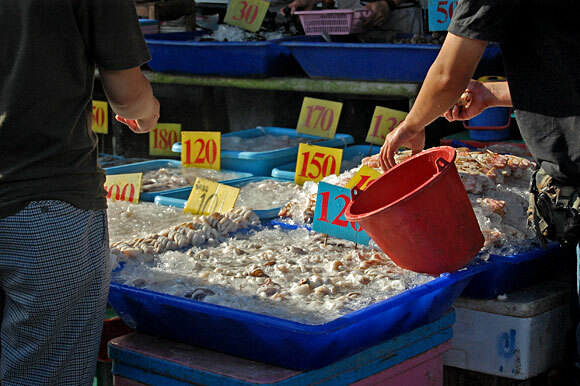 Different grades of squid for sale, sitting in open air trays in the afternoon sun. 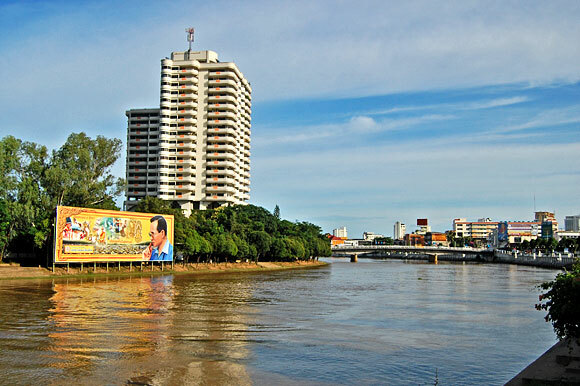 The Ping River across the street from the market. We purchased: a bunch of basil for 3bht(10¢), some tofu (5bht), broccoli, red onions, green onions, 2 watermelons, pomelo, 4 cucumbers, jackfruit, and a carrot. 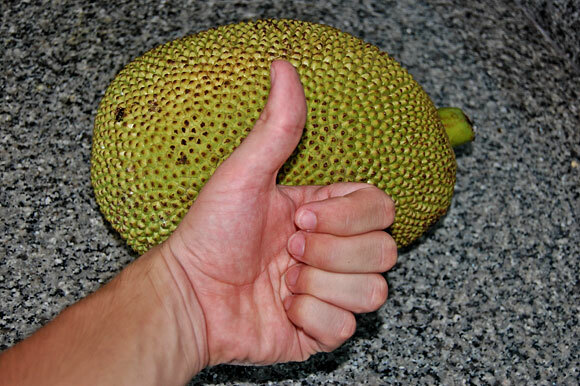 Unfortunately, we cut the jackfruit in half before realizing it wasn’t ripe. The lady we bought it from looked at us with skepticism, maybe that was why. The fleshy, edible parts were still white rather than vibrant yellow. I got latex-like sap over my hands and knife that refused to wash off. It’s a doubtful plan, but we stuck the two large halves together again and put them in a bag to see if they ripen. It’s a bummer because I was ready to eat like a king. A jackfruit king that is, yellow gold. 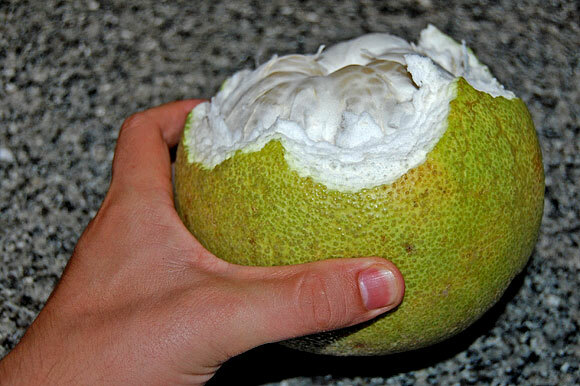 Large pomelo citrus fruit, partially peeled. Tomorrow is uncertain. There may be cows involved. Your pictures are fantastic, what kind of camera do you have? I’m thoroughly impressed. 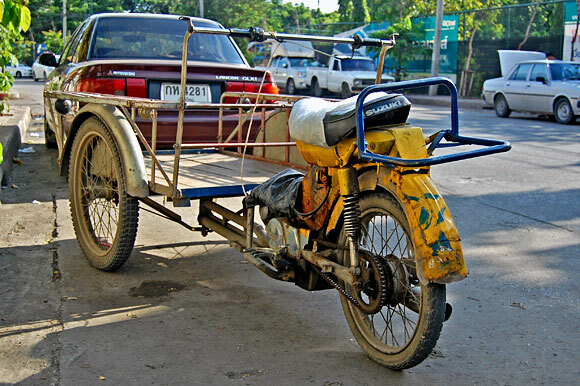 Glad Chiang Mai’s been working out so well for you thus far. If it’s cool I was going to post a link to your site from my blog, mostly because I’m far too lazy to upload as many pictures as you do. Right, I’m going to go finish a movie and then head to the sunday market. nik, there are no rhinoceros bugs at wieden+kennedy. please come back.